Here are some photographs I took in and around Rendlesham Forest on a grey day in 1983 November, nearly three years after the famous UFO sighting. At that time Woodbridge air base was still in use by the US Air Force. It has since closed. The original East Gate is long gone, replaced by high security fencing. 1. East Gate. 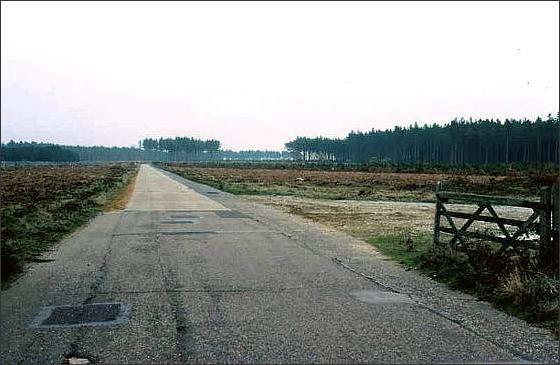 This gate, also known as the “Back Gate”, of Woodbridge Air Force base, faces east towards Rendlesham Forest. The small lodge used by the security guards is seen to the left of the road, near the centre of the frame. At some time in the years after this photograph was taken, the road layout inside the gate was changed. A traffic island was installed and the access road divided to pass either side of it, as can be seen on more recent photographs. 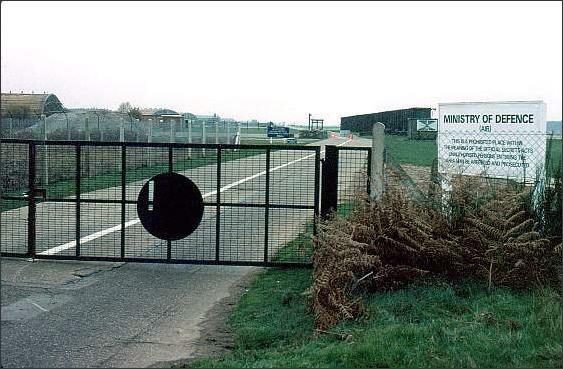 The main runway of RAF Woodbridge is towards the right of this picture, behind the white Ministry of Defence sign. An aerial view of the area today can be seen here. 2. The view from East Gate. Looking east from East Gate along the access road towards the forest. The Woodbridge runway and perimeter fence are to the left. When the security guards first ventured out in search of the object they thought had crashed on Night One of the event, they went along this road to the point where it meets a local road, turned right along that road and then first left along a narrow track into the forest (see here for an aerial view of the route). 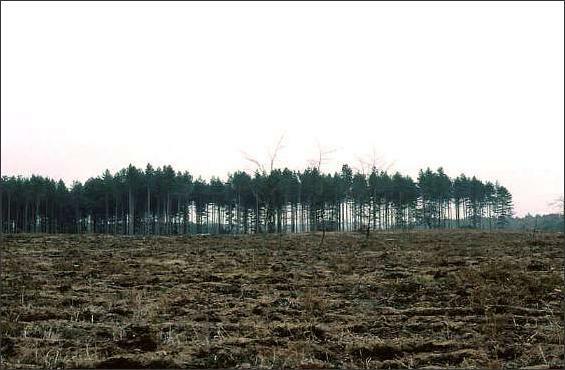 Much of the forest had been cleared when this photograph was taken in November 1983, so the view in this picture is far more open than it would have been at the time of the UFO sighting. New trees have now grown in place of those felled for timber. Note that the Orford Ness lighthouse cannot be seen directly from East Gate; it becomes apparent once you get further into the forest and the land begins to fall away to the east. 3. Still standing. 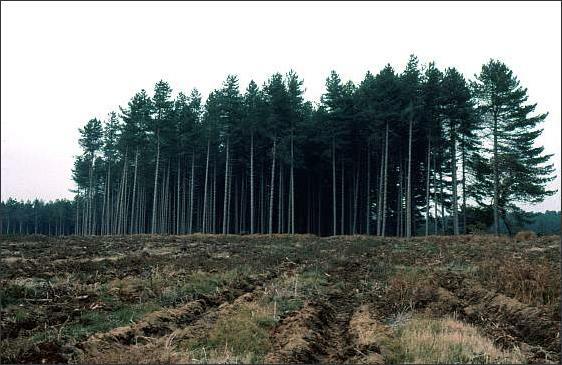 Although many of the trees in the area of the alleged UFO landing site were felled as part of normal forestry operations in the two or three years following the events of 1980 December, this stand remained at the forest’s eastern edge when I visited in 1983 November. This view was taken facing east and the trees include those in my nocturnal shot. For a different perspective on these same trees, giving a better idea of their height and distance apart, see Photo 4, below. 4. Forest edge. The remaining stand of trees at the forest edge, seen from the south. The supposed UFO landing site was among trees like these, in this same area near the eastern forest edge. From this viewpoint, the farmer’s field and Orford Ness lighthouse are off to the right. The UFO is said to have zig-zagged between these trees, an impressive achievement for a craft supposedly the size of a car. 5. Vince’s house. 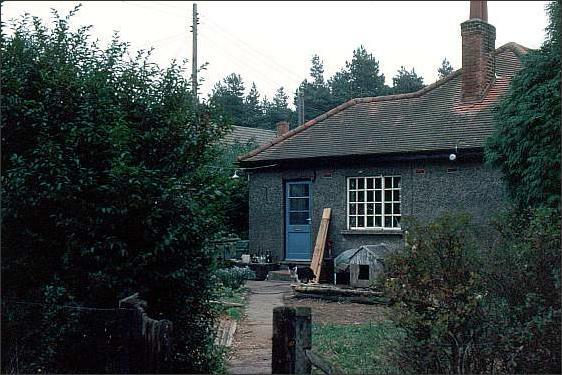 Forester Vince Thurkettle lived in this bungalow near Tangham House (marked on some maps as Tangham Farm) at the time of the Rendlesham Forest UFO event, a kilometre from the alleged landing site. The bungalow has now been sold off to private owners and considerably modified. It lies next to the current Forest Centre Office.